The Managed Hosting Service Level Agreement (SLA) is an agreement for providing web hosting services to your client. This agreement covers connectivity and hardware availability and uptimes, replacement guarantees, support packages and general terms and conditions. Special attention is paid to separating out company liability for hardware versus responsibility for restoring a particular customer environment. It is important for hosting companies to indemnify themselves against both direct and indirect loss or subsequent loss resulting from network downtime. This is important for web hosts whose client may be hosting many ecommerce or other transaction-based websites. saves thousands of dollars that would otherwise have been spent in time and attorney fees creating these documents! I can customize these contracts to my own needs with my own logo. A cost effective solution with professional results that wow your customers." This Managed Hosting Service Level Agreement is included in editable Word format that can be customized in Word or by using the included Wizard software. THIS AGREEMENT is made this Current Day day of Current Month, Current Year by and between Company Name ("Company") and Company Name ("Customer"). The purpose of this Agreement (hereafter referred to as the "Agreement") is to set forth a detailed Service Level Agreement ("SLA") under which Company will provide a service to Company Name in order to ensure the reliability and stability of all Web Hosting Services covered under this SLA. 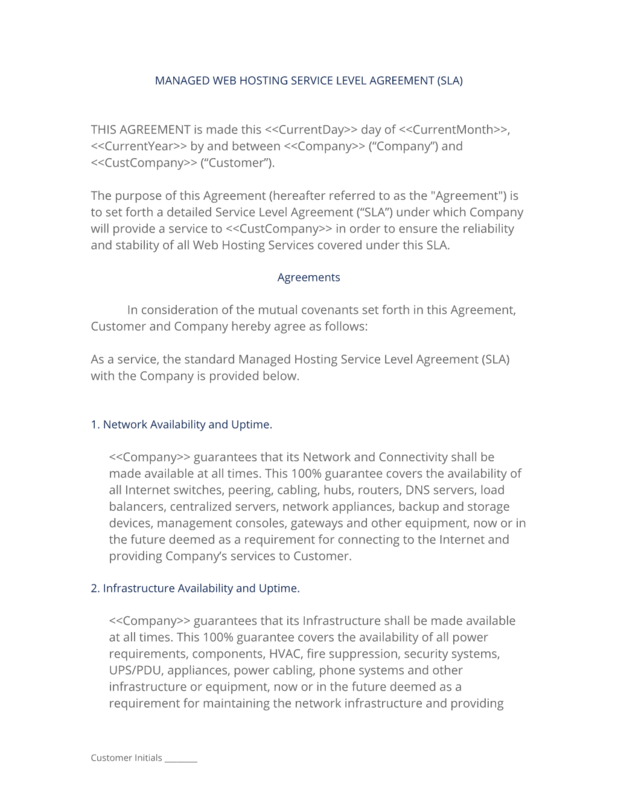 As a service, the standard Managed Hosting Service Level Agreement (SLA) with the Company is provided below. Company Name guarantees that its Network and Connectivity shall be made available at all times. This 100% guarantee covers the availability of all Internet switches, peering, cabling, hubs, routers, DNS servers, load balancers, centralized servers, network appliances, backup and storage devices, management consoles, gateways and other equipment, now or in the future deemed as a requirement for connecting to the Internet and providing Company's services to Customer. Company Name guarantees that its Infrastructure shall be made available at all times. This 100% guarantee covers the availability of all power requirements, components, HVAC, fire suppression, security systems, UPS/PDU, appliances, power cabling, phone systems and other infrastructure or equipment, now or in the future deemed as a requirement for maintaining the network infrastructure and providing Company's services to Customer. This infrastructure availability and uptime guarantee shall not extend to individual computer power supplies or computers or servers that are shut down due to excessive heat problems. In the even that Customer suffers any "downtime" or lack of network or infrastructure availability, the Customer shall receive a credit on their account subject to the table below. All requests for credit must be made within ten (10) days from the occurrence of the downtime and must be made in writing via a support ticket. All credit requests must be verified by Company staff and credits may take up to thirty (30) days to show up on Customer's bill. Company reserves the right to revoke any credit for downtime issued that is later discovered to have been be caused or attributed to Customer activity or external forces not related to Company network or hardware. Company warrants and guarantees that in the event of a critical component failure, Company shall replace such components at no cost to the Customer within minutes of Acknowledgement of the failure. Acknowledgement shall be defined as the creation of a support ticket for the customer by the Company concerning the critical failure, and the Minute Hardware Replacement Guarantee shall begin at this time. Critical components shall be defined as one as one or more of the following components: CPU / Processors, Memory (RAM), Motherboards, Network Interface Cards (NIC Cards), Hard Drives, Secondary Hard Drives and Disks, or any other required equipment. This SLA does not cover any special equipment that the Customer is using that the Company does not stock replacements for. This includes specialized storage devices, load balancers and networking equipment, optical drives, software and operating systems. Failure on the part of the Company to replace critical components within minutes shall result in a Insert Amount of Applied Credit credit applied to the Customer's account. All requests for credit must be made within ten (10) days from the occurrence of the critical component failure and must be made in writing via a support ticket. All credit requests must be verified by Company staff and credits may take up to thirty (30) days to show up on Customer's bill. Company's Hardware Replacement Guarantee shall cover the time spent to replace critical components after the acknowledgement by both the Company and the Customer that the critical component is the cause of the problem or downtime and replacement is the agreed-upon course of action. This guarantee does not cover any time spent restoring any operating environment or restoring the functionality of a particular server or server environment, including, but not limited to: rebuilding data or domains, rebuilding control panels or server consoles, digital certificates, CRON jobs, installing operating systems or virtualization software, software components, RAID arrays or any part of any configuration or setup concerning equipment provided to Company by Customer. Company is not responsible for any third-party loss due or attributed to any downtime suffered by Customer under this agreement. Insert the types of support you offer. Typically, this is a standard (free) and a professional (paid) tier. Add definitions for these levels and what can be expected. The following is a guide to the estimated times Customer should expect for different support requests made via phone or through the support ticket system. Emergency Reboot or Restart: 5 to 15 minutes. High Priority Requests: 1 - 2 hours. Medium Priority Requests: 1 - 4 hours. Low Priority Requests: 8 hours. Company cannot provide support at no cost for every problem that Customer may encounter or create while using our services. Support issues not covered under Customer's individual plan may be billed at an hourly rate of Hourly Rate per hour / incident. Company is committed to help Customer to resolve any trouble or issues requiring Company help or expertise. At no time will Company bill for support without prior notification and approval by Customer. The complete Managed Hosting Service Level Agreement - with the actual formatting and layout - is available in this Contract Pack.